Children’s Day – what day ISN’T Children’s Day? That was my first thought when reading about this “lesser” holiday. But the more I thought about it, the more I truly have come to appreciate this day. International Children’s Day is celebrated in many countries and usually, but not always, on June 1. The reason that the first day of June was chosen to celebrate children is unclear but the story I like the most is that the Chinese consul-general in San Francisco gathered a number of Chinese orphans to celebrate the Dragon Boat Festival in 1925, which happened to be on June 1 that year, and also coincided with the International Children’s Day conference in Geneva. I suppose since my daughter is Chinese the story of the date being set, including Chinese orphans, touches my heart. Traditionally (in China) children do attend school but there are no classes that day. Instead they take time to honor students with notable achievements and participate in parent-child activities and games. It is a festive, child centered day. Other countries have other traditions but the common thread is a child centered day of fun and parental bonding time. Now, I don’t think we are going to get our schools to suspend classes for a day but we can celebrate Children’s Day all the same. My daughter beams with pride when we have lunch with her at school, and showing us her work in the classroom is equally delightful. Maybe you could arrange to bring your child his/her favorite meal for lunch on Monday. Take cookies to the classroom to share with all the children (do this at the end of the school day as to not cause a big disruption) or plan a special after school activity. We will be having lunch with Miss Jess and taking her bowling after school. She typically has homework on school days, but I have arranged for Monday’s homework to be a day late. These are small things for sure, but are all special to Jessica. What is special to your child? Could you work it in on Monday? If your school has already recessed for summer, all the better – a picnic in the park with your child’s favorite foods – ok in our case that would mean a picnic of marshmallows and bacon – but how great would your child feel when presented with ONLY their favorites? Maybe it’s too late to do much this year – but that’s what is great about this “lesser” holiday, not much is required to make your child feel like a star for the day and strengthen your relationship. We all understand that Chinese adoptions are moving along at – well – a snail’s pace. The long wait time has spurred an interest in China’s Waiting Children/Special Needs program. This is GREAT news for those children who need homes now. Unlike traditional referrals from China, with the Waiting Children program prospective adoptive parents get to see a picture and a little information as to the child's needs before ever applying to see the file. Wow, that's great isn’t it? You get to see and oftentimes fall in love with “your” child very early in the process. If you have spent any time observing the Waiting Children process you will notice a trend…the pretty kids find homes first. The children that are considered “cute”, no matter how great their special need is, tend to have multiple families ask to review their files or, as is the case with Multiple Agency lists, those files are locked immediately. But what about those that don’t have the cute picture? Take a look at this picture. This little one was number 20717 on the March 2007 Waiting Child list. The special needs were a repaired cleft lip/cleft palate and the fact that this child was considered “old” by adoption standards at nearly 4 ½. Is this child a girl or a boy? We are used to seeing boys dressed in pink and “girly” clothes because in an orphanage you wear what they have. But this child? Nothing pink or girly at all. The March 2007 list was chock full of adorable pictures of little girls and boys. Some of those cute pictures had dozens of people ask to review their files. The way it worked back then was a lottery system – you submitted an application for a child and an applicant was randomly picked to review the file, the pictures were updated with the number of people who had applied to review their file. The phone calls were made and the internet was abuzz with news about who was picked. Back to #20717. The number of people who had applied to review the file? Zero. Why? The special need was relatively minor. Well, as it turns out that number, zero, was a mistake. One family had applied for this child. Mine. My husband saw something in those eyes, a spark, a hope, a smile that wasn’t on her face. #20717 is my very own Miss Jessica HuaLiang. You can’t tell by the photo that she is in fact a she. What you can’t tell by the photo is that she has the bubbliest personality; she has a wickedly funny sense of humor. You can’t tell that she is amazingly smart; she has only been home a year and a half and speaks nearly perfect English. She is loving and affectionate. She has her father wrapped around her little finger. She is healthy and well bonded. What you can’t see in that first mug shot is the amazingly delightful little girl she has blossomed into. Next time you are reviewing the Waiting Children/Special Needs list I want to encourage you to look past the pictures and into your heart, to see the bigger picture. Are you truly only open to a girl? Maybe your daughter is a SON. Maybe your infant is a toddler, or a 4-year-old…maybe he or she is 9? Maybe older. Pictured: Six-year-old Jessica loves her hair long. Here, she stands in front of the scroll given to her by her Chinese foster family. Welcome to Children's Hope International's Guest Bloggers! This is a new family feature to the Children's Hope blog. Beyond sharing a one-time story, CHI Guest Bloggers will be returning to write on varied topics - from cultural events, timely news, and best of all, their personal experience. We will be introducing several CHI Guest Bloggers in the coming weeks. Help welcome these writers by leaving a comment on their articles. Thank you! If you would like to suggest a topic for their blog posts, email Communications@ChildrensHope.net. Kathleen Carscadden is an adoptive mother. She's also an advocate for Special Needs adoption. 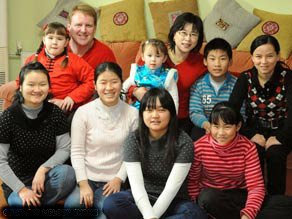 She and her husband Bob adopted Jessica from CHI's China Waiting Child Program in October 2007. Welcome Kathleen! More Ethiopia Referrals Make Families' Day! The referrals keep coming! Today we are pleased to have referred a 4-year-old little girl, a 7-week-old baby boy and one of the sibling sets that were viewble on the Ethiopia Waiting Children’s website. The sisters are 4 and 7 years old. The families waited 6 ½ months, 10 months and 6 weeks, respectively to be matched. Congratulations to all of the families, and the children. The Carley Family is home with their son! View pictures from their return home on their May 6th entry of their personal blog, Love is Spoken Here. We'll be sharing more of this family's experience in the upcoming Children's Hope E-news. Thank you for sharing Carleys! Welcome home! The Frick family also wanted to share how they are doing. View their blog, "Got Injera?" Do you see a family resemblance? They have been home close to 16 months with their daughter! Colombia Program Update Includes Several Referrals! The Children's Hope Colombia Team is excited to announce that the Colombia program has given four referrals this week: two siblings, a boy, 2 1/2, and a girl, 5 1/2; and 2 baby boys, both around 1-year-old! All three families should be able to travel next month. In addition, families have accepted their referrals this week for a sibling group of 4: ages 11 and under, and a young girl, age 7. ALSO our Colombia Team was able to meet a beautiful 16-month-old from Colombia and her elated parents at the St. Louis airport this morning! Traveling: In additional Colombia Program news, a family is returning to the US tomorrow after completing the adoption of siblings, 11-year-old sister and 8-year-old brother. A Colombia Program family leaves tomorrow for a 1-year-old boy and we have one family in country for a 10-year-old girl. Congratulations to all of these families as they transition! We are delighted to announce that today we received 4 referrals for the Ethiopia Program. We received 2 infant females, 2 and 4 months old, and 2 infant males, 3 and 6 months old. The families that received the infant girls waited 11 ½ and 12 months and the families that received the infant boys waited 9 ½ and 10 months from their adoption paperwork submission. We also received several older sibling groups, now Waiting Children (see www.chifamily.net for details). Congratulations to all the families that received referrals today! "CNN interviewed me today, on China's Earthquake Anniversary. On the weekends, my foster children, survivors of the earthquake, visit with me. It is their story - Ren Qiang and Ren Yan's - CNN wished to tell." From Application to Completion, the Ethiopia Adoption Process - Happy Birthday, Ashton! Mike and Jo McGregor adopted Ashton in June 2008 from Children's Hope International's Ethiopia Program. On Ashton's second birthday, the proud parents created a 10 minute video to celebrate Ashton's becoming a part of the McGregor family and all the joy he has already given them. "It's been a whirlwind of 2 years that I wouldn't mind repeating over and over and over and over again. To say we feel blessed would be a drastic understatement as honored, humbled, and truly inspired by life is more like it. Ashton, we love you more than choo-choos and horsies and cookies combined. You're the smiles, the hugs, the tears, and the eyes we've always dreamed would grow our family." Click this link to visit the family's blog and view their video. Thank you, McGregors, for sharing! Want to share your story? Email photos, links or your own words to Jennifer.Newcomb@ChildrensHope.net. Overnight, the CCAA uploaded photos and information for a large set of waiting children with special needs. 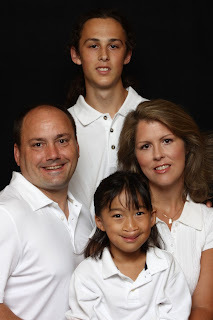 Throughout the day, May 4th, the Children's Hope China Team will be adding these children to our www.CHIFamily.net site. Many of these children have minor special needs. However, no families' requests on our current list match these children. We would love to find these kids a home. Please log in and, if it is in your heart to do so, pray over these children. If you are interested in adopting a special needs child and are not currently a Children's Hope family, consider applying today to view these children. CHIFamily.net is password protected for application approved families. Thank you! As children become available for review on www.CHIFamily.net, I will be posting notifications to the Children's Hope yahoo groups. I hope this helps keep families informed and up-to-date on the frequency of additions to our online photolistings. Ann will verify that you are a CHI approved family and then email you a Yahoo invitation to join the CHI Yahoo group(s) you request. Please do not hesitate to email Ann if you have any problems or questions.